"Mega Goomba" redirects here. For information about the boss from New Super Mario Bros., see Mega Goomba (boss). Big Goombas, also known as Grand Goombas, Giant Goombas, or Mega Goombas, are large Goombas that have appeared as semi-recurring enemies throughout the Mario franchise. A Grand Goomba in Super Mario Bros. 3. Grand Goombas make their first appearance in Super Mario Bros. 3, where they are only encountered in Giant Land, with Giant Koopas and Piranhacus Giganticuses. Despite their massive size, they do not pose much of a threat. Jumping on them once or swinging Mario's tail with a raccoon tail or Tanooki Suit defeats them like regular Goombas. They are again seen in the remake of the game in Super Mario All-Stars with their role unchanged. 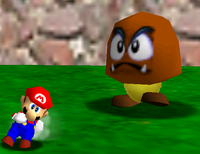 A Grand Goomba in Super Mario 64. They appear again in Super Mario 64 and its remake in Tiny-Huge Island. If the player enters or warps to the huge side, the Goombas become Grand Goombas. These Goombas take longer to notice Mario, as only if Mario is very close to them, they will charge at him. If a Grand Goomba hits Mario, Mario will instead lose two points of health instead of one point. These Goombas can only be defeated if jumped on, because punches and kicks don't affect them at all. Ground Pounding on them will produce a Blue Coin. Simply jumping on them also defeats them, but only produces a single yellow coin. Mario stunning the Grand Goomba in Super Mario Galaxy. In Super Mario Galaxy, only one Grand Goomba appears in the entire game. It appears in the Gateway Galaxy on the second metal planet along with normal Goombas, and must be defeated to get a key in order to both free a trapped Luma and head inside the planet to retrieve a Grand Star. The Grand Goomba only appears when the player speaks to the trapped Luma. The Grand Goomba is slow, but the normal Goombas are still fast, and it makes a loud pounding noise when chasing Mario. Spinning it or hitting the nearby metronome puts it on its head, and a kick while it's stunned takes it out. Attempting to jump on it either through Somersaulting or Wall Jumping off of one of the metronomes will simply hurt Mario, regardless of his location relative to it. Giant Goombas reappear in New Super Mario Bros. Wii. Giant Goombas only appear in the World 1 Enemy Course, where two of them appear trying to stop the player from saving the kidnapped Toad. Giant Goombas share the same attack pattern as many of their smaller relatives. When jumped on, they split into two Hefty Goombas. If Ground Pounded, it splits into four normal Goombas. It takes four fireballs to defeat a Giant Goomba. Giant Goombas cannot be frozen by ice balls from Ice Mario; they will break out instantly after being frozen. Two Giant Goombas in a pre-release Supermassive Galaxy in Super Mario Galaxy 2. In Super Mario Galaxy 2, Giant Goombas return as enemies. They only appear in the Supermassive Galaxy. Like in the predecessor, Mario can attack them by spinning them and then kicking them to defeat them. Paragoombas also get their own big counterpart in this game. A Big Tail Goomba and two Tail Goombas in Super Mario 3D Land. No regular Giant Goombas appear in Super Mario 3D Land. However, a variant called Big Tail Goombas appear instead; they are Giant Goombas that have Tanooki tails. They appear only rarely, and have the same attack pattern as a normal Tail Goomba. As such, one stomp to the head or swipe of the tail with a Tanooki Suit defeats one, but gives three coins instead of one for a normal Goomba. Big Goombas, Hefty Goombas, and normal Goombas in New Super Mario Bros. U. Big Goombas reappear in New Super Mario Bros. U. They act the same as in New Super Mario Bros. Wii. When stomped or Ground Pounded, they still split into two Hefty Goombas or four normal-sized Goombas, respectively, but they now require three fireballs to take out and can now be defeated by Koopa Shells. They are found in Soda Jungle's course Jungle of the Giants and in a challenge called Big Goomba Bounce Bash. Big Goombas reappear in Super Mario Maker and Super Mario Maker for Nintendo 3DS as enemies. In this game, jumping on one will split it into two normal-sized goombas similar to a Hefty Goomba. This applies to all styles, even though they did not have this feature in Super Mario Bros. 3. They are variants of the Goomba, and can be made in the Course Maker by dragging a Super Mushroom onto a regular Goomba. It can later be given wings to turn into a Big Paragoomba. They can be placed in Warp Pipes, Bill Blasters, Blocks, and placed on tracks. An uncommonly large Grand Goomba, thought to be the progenitor of the sub-species, appears in Koopa Capers, having been presumably brought to Dark Land by Wendy O. Koopa, who needed some of its leg hairs for a potion she wants to create. After crossing a Podoboo-infested body of lava in the Magma Pits, Luigi encounters the Grand Goomba wandering around aimlessly, and if he decides to crawl between its legs, he will go unnoticed by the giant fungus. If he decides to try and jump onto a nearby ledge instead however, the Grand Goomba will grab him mid-leap, stuff him in a sack, and begin to head home to the Land of the Giants, muttering that Luigi will make "a lovely plumber omelet". Giant Goomba in Super Smash Bros. Brawl. The Giant Goomba later appeared in Super Smash Bros. Brawl as an enemy in the Subspace Emissary that takes a few more hits to defeat than a regular Goomba. Jumping on their head three times or just simply hitting them enough times will defeat them. A Big Goomba in Super Smash Bros. for Nintendo 3DS. Big Goombas reappear in Super Smash Bros. for Nintendo 3DS as enemies in Smash Run. Like their smaller counterparts, they can charge at the player and can be defeated by jumping on it three times. Metal Mario racing past a Giant Goomba in Mario Kart 7. Giant Goombas appear in Mario Kart 7 for the Nintendo 3DS. They act as obstacles to racers and cause a kart to spin-out if hit. 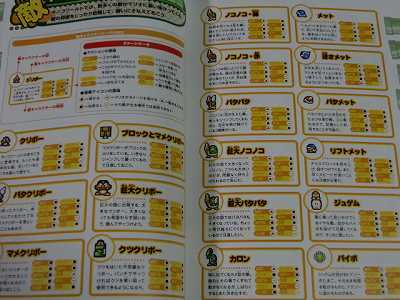 They appear in Mario Circuit, Piranha Plant Slide, Wii Mushroom Gorge and Wii Koopa Cape. They replace Goombas which appeared in past installments. A Big Goomba appears in Mario Golf: World Tour on Hole 2 of Wiggler Park. Because it appears behind the green, it is unlikely that the player should hit the ball into it. If they manage to do so, it will cause the Big Goomba to look around wondering what just happened while the player's ball would likely land Out of Bounds. Mega Goomba being fought in Mario Party 10. Mega Goomba makes its first Mario Party appearance in Mario Party 10, where it is one of the game's bosses. 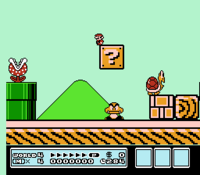 Its boss minigame, Mega Goomba's Ladder Leap, involves players climbing up to a higher platform and jumping down onto it to deal damage. A Mega Goomba makes an appearance in Mario Party: Star Rush, as the first boss. His boss minigame, Mega Goomba's Bad Dream, has the players collect 25 apples when he is asleep. When Mega Goomba stops dreaming, players need to collect another 25 apples, though he attacks players who approach the apple pile. After the minigame ends, a butterfly appears and Mega Goomba chases it. In Toad Scramble mode, the winner gets one Star. Mega Goomba is an enemy fought in Mondo Woods of Paper Mario: Color Splash. The Mega Goombas were originally normal-sized Goombas until they were enlargened by Kamek's magic. Mega Goombas attack by jumping on Mario, doing 33 HP of damage. N64 Super Mario 64 A giant-sized Goomba, as the name suggests. In Super Mario 64, punching and kicking had no effect on this brute. It could be stopped like normal Goombas--by jumping on it from above. A colossal Goomba appears as the boss of world four in New Super Mario Bros., but that's a Mega Goomba, not a Giant Goomba. Wii New Super Mario Bros. Wii (11/2009) It's a Goomba, only bigger! And much like normal Goombas, the worst they'll do is run at you. Unfortunately, their size actually makes this attack pretty dangerous! They can also stomp to knock you off your feet. They have a lot of health, but they take massive damage from being stomped on, just like a regular Goomba. Fortunate! It's a Goomba, only bigger! And much like normal Goombas, the worst they'll do is run at you. Unfortunately, give their size, that actually puts you in a lot of danger. They can also stamp to knock you off your feet. They have a lot of health, but you can do major damage quickly just by stomping on them. Huzzah! These giant-sized Goombas make quite an impression. Some will net you a coin when you jump on them, and others will split up into smaller Goombas. They're often much stronger than normal Goombas, but jumping on them a few times usually does the trick. There's also an even bigger one out there: the Megasparkle Goomba. He's so shiny! Quotes Usual: "PRETTY BIG, RIGHT?" ~ "I LOOK DOWN ON YOU!" ~ "HOW DOES IT FEEL?!" ~ "BEAT IT, SMALL FRY!" A Goomba enlarged by Kamek's magic. "Once Mega Goomba spots a target, he will go rushing in for the attack. You'd better run if you're spotted!" This page was last edited on April 5, 2019, at 11:10.